We are proud to announce official Docker containers for our latest openSUSE release, 13.1. Docker is an open-source project that automates the deployment of applications inside software containers. With the official openSUSE Docker containers it’s now easy for developers to leverage the power of our Linux distribution and it’s free software Eco-system as base for their applications. The Docker project was released in March last year. Until now, during this short amount of time, more than 450 people contributed with patches and 14,000 containers have been published on its central index. Docker recently released version 1.0, the first one declared enterprise-ready. The container technology has been around since quite some time, think about FreeBSD jails, Solaris zones, OpenVZ, LXC. However none of these tools has ever attracted as much attention as Docker. Docker has been so successful because it makes easy to harness the power of containers and at the same time it provides two important features: a developer oriented work flow to manage containers’ life cycle and a set of collaborative functionalities. Managing Docker images shares analogies with version control systems used to track the evolution of source code. Containers are stored on a central repository called Docker Hub. Users can download them using the “pull” command. They can “diff” a running container to see which changes have been made. They can fork containers and “push” their derived work back to the Docker Hub. The creation of new containers starting from the existing ones is achieved using Docker’s integrated build system. The feature is based on a special file called “Dockerfile”, a text file containing a list of Docker build directives. These commands can do several operations like: select the image to extend, execute a command inside of the container at build time, expose a service running inside of the container to the outside world and more. 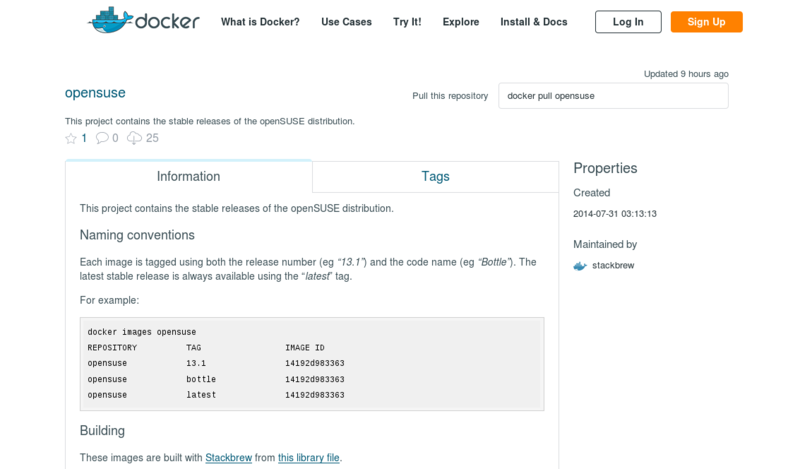 Starting today the Docker Hub provides official openSUSE containers for our stable releases. This container can be used as a foundation block to create new awesome containers based on our beloved Linux distribution. The first thing to do is to install Docker by following the official installation instructions for openSUSE. Users of Factory can install docker straight from the main repository. The same should happen pretty soon to Tumbleweed users (the docker package is currently staged in the Tumbleweed:testing repository). MAINTAINER <your name> "<your email>"
At the end of the build process the new image will be added to your list of local images. For more complex images (like ones exposing services running inside of them), please refer to Docker’s documentation. If you find something about our containers that can be improved, please collaborate with us. We have created the docker containers with KIWI, openSUSEs Operating System Image and Appliance builder which is the basis of SUSE Studio and the imaging functionality of the Open Build Service. The files used to create these images are available in our Github repository. They are free software, released under the MIT license. You can run, copy, distribute, study, change and improve them. We have to thank Flavio Castelli, maintainer of the Docker package, for the creation of these containers, the KIWI developers for adding the docker build format and finally the Docker team for marking these containers as official on the Docker Hub. Awesome! Thanks for getting this going. Great job catching the wave\b\b\b\b tsunami. Excellent work Flavio, and very nice write-up Henne. Great — I was already afraid that the good openSUSE community would be late to this development. Only bits that need modification are various references to containers when in some cases they should be referencing images… Docker containers are the highly customizable runtime environments while images are generally the file systems used to create Containers. And, kudos to the openSUSE Docker Maintainers who pushed v1.2 within 3 days of the published announcement (and release). When I checked, including Fedora and Ubuntu had pushed the the new version yet with its significant improvements.